This is a brilliant short novel – l75 pages – set in the cathedral town of Coventry, England. It takes place, mainly, on the night of November l4, l940 when the Germans bombed Coventry and the whole city, including the cathedral, went up in flames. Harriet Marsh is on fire duty at the church. She lost her husband in l9l4 at the Battle of Ypres and this new war has chilling memories for her. Beside her is young Jeremy Fisher, another fire-fighter, whose artist-mother was a casual friend of Harriet’s. They set off together to try to find his mother, trudging through a city smashed and burning and full of shattering casualties. Humphreys writes a deceptively simple prose. But her situations and careful details pack a decided punch in their under-statement. 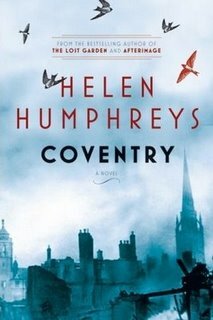 This is really a story of the loss suffered by two women – set against the background of the enormous loss of Coventry itself. But for each woman there is the blessedness of love recovered. It makes for a succesful book based on a city that has become almost a symbol for World War ll. Helen Humphreys is a Canadian author, living in Kingston, Ontario. She has written five prize-winning novels as well as a non-fiction work “The Frozen Thames”.